Entertaining is a passion for many of us and small features in your property can quickly become magnificent or focal when you have twenty or thirty people in your home examining it from top to bottom. But when it comes to an outdoor event, there is nothing that draws attention like a fire water table, not least because of the obscure clash. While fire water tables are more commonly seen in luxury and high-end restaurants, they have been adapted to be used as ornamental and focal points in your home. Typically they are used outdoors for safety, but there’s no reason why you couldn’t have one inside of your property if you were able to attach the necessary gas and water lines to power it. What is a Fire Water Table? Firewater tables are a unique combination of fire and typically a small waterfall or water container. Frequently you’ll find that they use gas fires which either sit on top of a tank of water or are surrounded by small waterfalls of liquid. Depending on how you choose to use it you can either eat at or around it, or set it up so that it’s more frequently used as a focal point rather than as an area to eat. When you’re entertaining outdoors, it’s incredibly challenging to create a focal point for your yard in the same way that you would in your living room. A focal point is a key to creating a composition, to balance out the rest of your property and to create a composed feeling rather than leaving your property looking like an odd collection of assorted items. 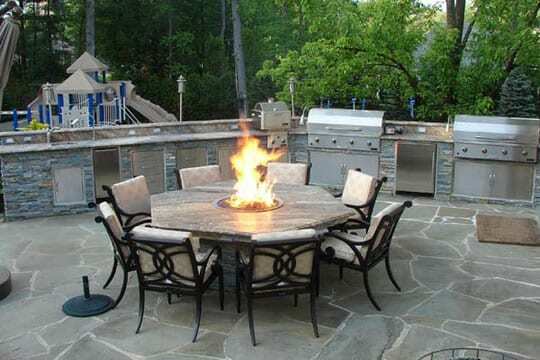 A focal point like this is especially critical once it becomes dark, which is when a fire water table starts to shine and when most of us like to entertain our friends and family members. Due to the size, shape and the flame of a fire water table, it makes a powerful focal point which is impossible to overlook, and that’s precisely what you want to achieve. Although not the primary purpose of these magnificent tables, an extra benefit of them is that they do produce some residual heat especially if that table is relatively small. When the summer is coming to an end and the evenings can become a little cooler, this added heat is going to be well received, and it can help to make your dinner parties that much more enjoyable. While it’s possible to keep warm in other ways like putting a jacket on or powering up an outdoor heater, neither of these solutions are elegant, and they can ruin the feel of your event. Instead, a firewater table can keep you warm without overdoing the heat, and it does so with elegance and poise. Similarly, as the sun sets, it’s important that you and your guests can still see each other and around the property. Fortunately, large fire water tables can produce far more light than you might imagine, plenty to keep your property well-lit to ensure everybody’s safety and a comfortable environment. But an additional benefit that’s often overlooked is that the light that a natural fire casts is far more soft and comfortable on the eyes than artificial light, especially in the evening. Rather than turning on powerful and bright LED lights which can ruin the mood, a warm fire will leave you feeling toasty and is far more enjoyable to stare at throughout the night. 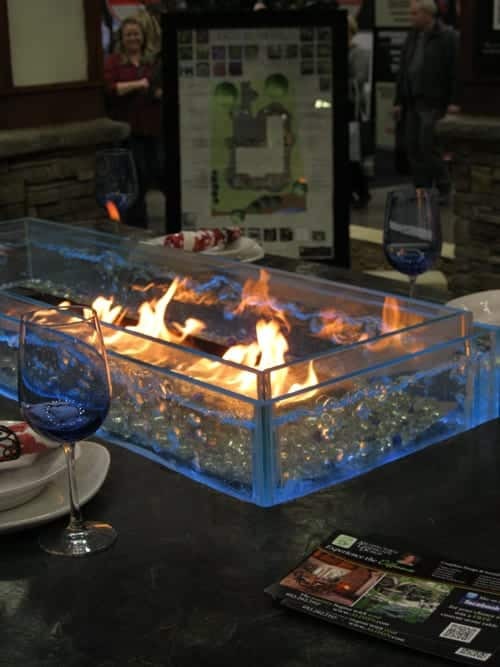 While these benefits are significant and important to mention, the primary reason for buying a fire water table is for the unique dining experience. There is nothing like it, especially when it comes to round tables that are centered by a significant flame and water combination. It can help to form conversation, keep you warm and give you exciting and comforting visual stimulation as the evening wanes and the wine starts to settle. If you like to host parties or simply enjoy a relaxing evening by yourself or with your family, there’s nothing like sitting around an open flame as you enjoy your meal.